Create unforgettable spring and summer gardens with top quality, exhibition flower bulbs from Van Engelen. Comprehensive Collection of Dutch Flower Bulbs - Van Engelen supplies the most comprehensive collection of the best Dutch flower bulbs at wholesale prices to professional horticulturists across the U.S. For decades, Van Engelen has provided American horticulturists with reliable access to exciting introductions as well as classic Tulips, Narcissi, Allium, Crocus, Camassia, Fritillaria, Galanthus, Lilies and, rare, hard-to-find flower bulbs. One may choose from over 800 varieties of the world�s best flower bulbs. More recently, Van Engelen has added Herbaceous Peonies for fall planting at a tremendous discount. Van Engelen also offers a huge collection of indoor flower bulbs including Dutch Amaryllis, South African Amaryllis, Paperwhites, Anemone Giants, Freesias and Ranunculus. Personal, Professional Service - Located in the northwest corner of Connecticut, landscape architects, designers and professional horticulturists may contact Van Engelen for personal help in planning historic garden restorations, massive naturalized plantings or specific installations at private gardens. Orders may be packed by client or planting site, and special quotations can be provided for quantities of individual varieties in excess of published pricing. 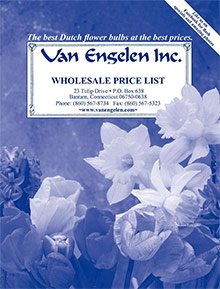 Van Engelen never substitutes name varieties, bulb size or quality. All orders are shipped for fall planting at the proper time by horticultural zone, or by a requested schedule. Special Collections and Website Specials - Each year, Van Engelen features a series of Special Collections that pair companion varieties in smaller unit sizes so that professionals can take advantage of their impeccable quality, extensive collection and wholesale pricing for clients with smaller space gardens. Some of the most popular collections include The Latest May Tulip Garden, The Month-of-Naturalizing Narcissi Garden and Northwest U.S. Native Heirlooms. From June through January, ever-changing Website Specials are posted online to showcase both classic and new landscape design concepts and companion plantings with even further savings. A fourth generation family business dating back to the 19th century in the Netherlands, Van Engelen is highly regarded for the diversity and quality of its flower bulb collection and personal, professional service. Visit our website for thousands of photographs, in-depth horticultural information and Website Specials.